AWPL Foundation Scholarship Competition 2016 winners and sponsors, L-R: Lauranne Wolfe; Sponsor C. Hope Arber; Alexa Castellano; Owen Lynch and his mother; Sponsors Susan D. Dickes, Glenn P. Dickes. The Albert Wisner Public Library Foundation is delighted to award annually three $1,000 college scholarships on the basis of an essay-writing competition. The 2016 scholarship recipients are WVHS seniors Alexa Castellano, Owen Lynch and Lauranne Wolfe. Alexa plans to study international relations at George Washington University; Owen will pursue a biology major at Hartwick College, and Lauranne will attend Vassar College and is contemplating a double major in history and mathematics. 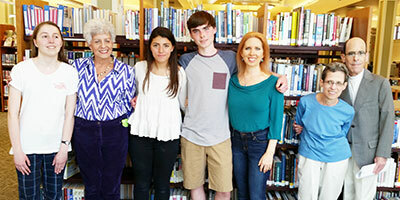 This was the tenth year of the Albert Wisner Public Library Foundation essay competition. Glenn P. and Susan D. Dickes have sponsored two of the scholarships since the competition’s inception; C. Hope Arber added a third scholarship in 2012. Any college-bound senior residing in the Warwick Valley Central School District is eligible to participate in the competition. Next year’s essay topic will be announced in January 2017.